Close stitch colour mop. Denim material with one piece of harder cloth on each side of every section. 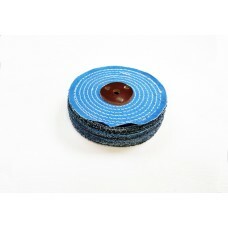 The harder backing cloth makes the wheel more wear resistant. Good choice of mop for middle processes for example cutting softer metals such as brass, copper and aluminium with compounds such as 113GZ, lustre, 439T green, P14 are good example. On more flat work then use white stitch mops.